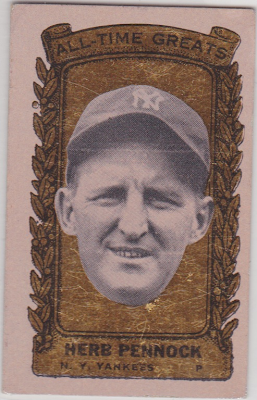 Winner of 240 career games, Mr. Pennock's career highlights include three World Series titles with the Yankees, spread across a decade of decent-to-excellent performance. He received MVP votes for three straight years, 1924-26, perhaps due to the sheer number of appearances (40, 47, 40) and innings pitched (286, 277, 266) for such a well-known team. High-innings pitchers create a classic dilemma for managers. Do I stick with the hot-armed guy? Is he just going to burn out at a younger age if I do? Writers like to harp on Dusty Baker for abusing young pitchers, which might or might be the case. Pennock clearly dropped off in total innings after that pounding from age 30 to 32, but who doesn't decline by 35? 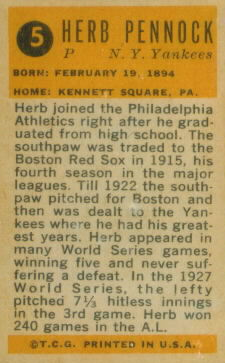 Herb remained effective as a reliever and spot-starter into his late 30s, even if his .500+ W/L record seems buoyed by that killer Yankees lineup. These card backs feature the only player bios from any Bazooka set (the rest came printed on gum boxes) and they helped kids appreciate players long since retired. The card stock's similar to contemporary Topps sets and surface foil scratches easily, but examples otherwise hold up well over time. Don't overpay for the cards, which should be $5 or less for low-grade "commons," if you can say that about a HOFer. There's basically Ruth, Gehrig, and Cobb for ~$50 and everyone else for significantly less. Kenesaw Mountain Landis, baseball's first commissioner, makes an unusual guest appearance in this set. 1956 Topps printed league presidents William Harridge and Warren Giles on cards #1 & #2, but executives rarely show up on cardboard. After all, did kids want to be a stuffed shirt with slicked-back hair...or did they want to be Willie Mays? How much is the shown Herb Pennock worth? I may have the exact same one! When I see 1963 Bazookas ATGs at shows, they're priced between $10 and $20. The superstars (Ruth, Gehrig) will go for more.